Partially furnished 3 bedroom rental home, located in secure village on Soi Nermplabwahn, walking distance to many local Thai Markets, shops, restaurants and bars. 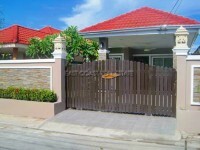 The house has 3 bedrooms and 2 bathrooms, kitchen and lounge area. Would be suitable for a tenant looking to rent who has some of their own furniture.